Storm damage cleanup in Peterborough, ON is certainly a daunting task. No one really wants to have to deal with the aftermath of a serious storm. However, at Van Till Tree Care, we are available 24/7 for all sorts of emergencies. When a storm hits, we are well prepared to begin the cleanup procedures in your yard. We can help remove fallen limbs and trees. We can also trim those that look like they might be on the verge of wreaking more havoc. Use our form below to request a free quote on your Storm Damage Cleanup needs in the Peterborough, ON area. No matter where you live on the planet, the potential for storm damage exists. Obviously, we won’t all face the same kinds of storms in life and the repercussions will vary. But, when storms hit, damage cleanup is pretty much inevitable. Wind and rain storms invariably knock down trees and their limbs. This can lead to damaged structures and vehicles. Sometimes, the limbs don’t fall completely, but are left precariously hanging on. In instances like these, it is in your best interest to hire someone with storm damage cleanup experience. Van Till Tree Care can come and cut potentially dangerous limbs and trees down. You might also need them to clean up other limbs that have successfully fallen on their own. If a tree has been downed, we will be able to cut it into pieces, haul it away, and grind the stump out of your yard so that you can go back to business as usual. The pricing for storm damage cleanup is based on several different variables. If the cleanup can wait until normal working hours, the job will likely cost less than if an emergency appointment is required. Also, the amount of debris that needs to be removed, coupled with any additional cutting and trimming, will play a significant role in the price you pay for the storm damage cleanup. When larger limbs fall, or need to be removed, that adds to the price as well. We take each situation on an individual basis. That is why our expert arborists will offer you a free quote for your storm damage cleanup needs. We will evaluate the risks and the necessities and treat you honestly and fairly. Van Till Tree Care has been in the business for nearly twenty years. 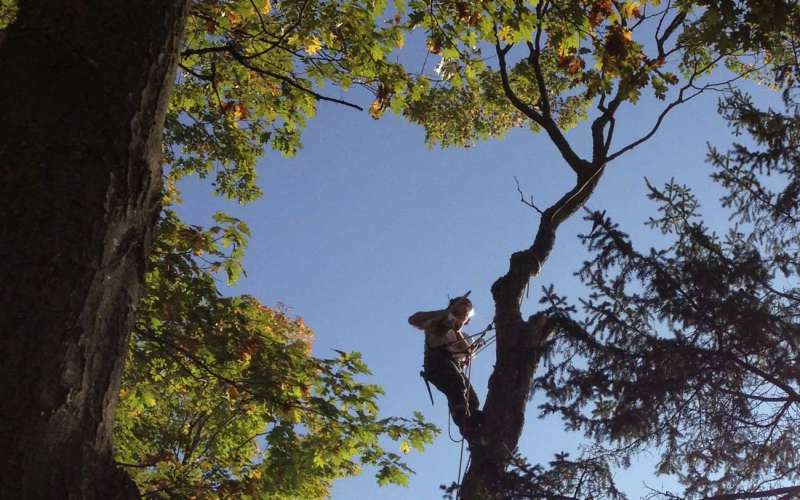 Our owner holds multiple certifications in the arboriculture industry. We are devoted to caring for, maintaining, and preserving trees. That includes the ones that sustain damage in the event of a storm. You can call our Peterborough tree service team for your storm damage cleanups 24/7. We will provide you with a free quote and do everything in our power to return your yard to the state it was in prior to the storm. We aim to keep you and your family safe while maintaining the health and well-being of the trees on your property.